In the late 1970s mountaineer Hamish Hamilton, already with the legendary Force 10 tent design behind him, began thinking about sleeping bags. Being discontented with the bags and clothing he had been using in winter in the Scottish highlands, he became intrigued by how the Inuit kept warm, utilising animal hide with the fur on the inside. By reversing the hide so that the tips of the fur were in contact with the skin, the Inuit found that moisture laden air was able to circulate and escape through the porous hide. Even in heavy rain, and after vigorous exercise, their skin remained dry and safe from freezing as the fur’s properties ensured water was removed quickly from the garment. This interested Hamish as unlike other outdoor designers, Hamish was concerned with comfort from the inside rather than waterproofness from the outside. Hamish had been working with pile fabrics and was impressed with their performance and durability, now he needed a really superior shell fabric. There are many stories of how Hamish went on to design Pertex which became the shell fabric for his sleeping bags. Our favourite is the one involving the typewriter ribbon; Hamish became interested in how the finely woven ribbon moved the ink across its fibres. With this in mind he visited many textile factories before eventually arriving at Perseverance Mills in Padiham, Lancashire where Pertex was eventually developed and produced. Hamish formed Buffalo in a small workshop in Sheffield and began manufacturing a sleeping bag system. By adding layers, this system could be used all year round, from casual camping to Scottish winter conditions. Buffalo Sleeping bags were the very first sleeping bags to be made from Pertex, and combined with fibre pile they proved unbeatable for performance in wet and extreme conditions, and for durability; some of our original bags are still in regular use today. The team Hamish gathered at Buffalo all had serious outdoor interests, from cycling, climbing, caving and walking to paragliding and cross country skiing. 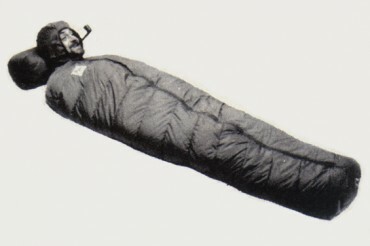 This led to the original patented concept of Pertex and Pile sleeping bags being developed to include Pertex and Pile clothing for serious outdoor people. Hence, all the designs were those specifically needed for various pursuits, not just conceptual design. 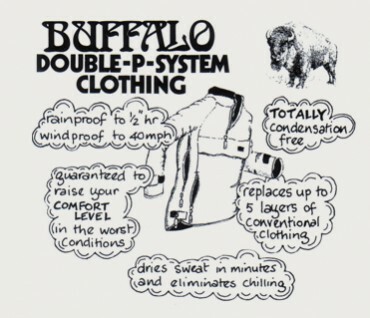 Buffalo originated the first single-layer clothing system, which we called the DP System. DP stands for Double P as in Pertex and Pile. The iconic Buffalo Mountain shirt won the Outdoor Writers Guild Golden Boot award in 1986. Over the years the Buffalo team worked with outdoor professionals around the world to ensure their requirements were met and the clothing and sleeping bags were put to the most rigorous tests. Through word of mouth, we rapidly gained a reputation as designers and manufacturers of exceptionally effective, durable garments and to this day, have a loyal customer base who come back to us time after time. We confidently state that our products do what they claim, and are proud to have been “Between you and the Wilderness” for over 30 years.